Add this vanity to your bathroom for more traditional style in your home. Its beige tan marble counter and white solid wood base will look beautiful in your home. The simple look of the double-door cabinet and drawers is useful and classic. Add a classic feel to your bathroom with this simple vanity set from Wyndham Collection. Use this vanity to bring more traditional style into your bathroom. Its beige tan marble counter and white solid wood base will look beautiful in your home. Made with a roomy double-door cabinet and drawers, this vanity has lots of room to keep items like toothpaste, towels, and hair brushes. This simple vanity set from Wyndham Collection will fit right into any bathroom decor. Enjoy the popular modern look in your bathroom with this beautiful vanity. Its beige tan marble counter and white solid wood base will look beautiful in your home. The single-door cabinet and drawer are great for putting away bathroom items. This set from Wyndham Collection is great for anyone looking for great style and function in their bathroom. If you want a vanity that is both stylish and useful, this modern vanity is perfect. Made with a special white solid wood base and a beige tan marble counter, this piece will make your bathroom look even nicer. There's plenty of space for items in this vanity's drawers and double-door cabinet. Bring a classic look and feel to your bathroom with this beautiful set from Wyndham Collection. Acclaim 48-inch W 8-Drawer 2-Door Vanity in White With Marble Top in Beige Tan With Mirror Add this vanity to your bathroom for more traditional style in your home. Its beige tan marble counter and white solid wood base will look beautiful in your home. The simple look of the double-door cabinet and drawers is useful and classic. Add a classic feel to your bathroom with this simple vanity set from Wyndham Collection. 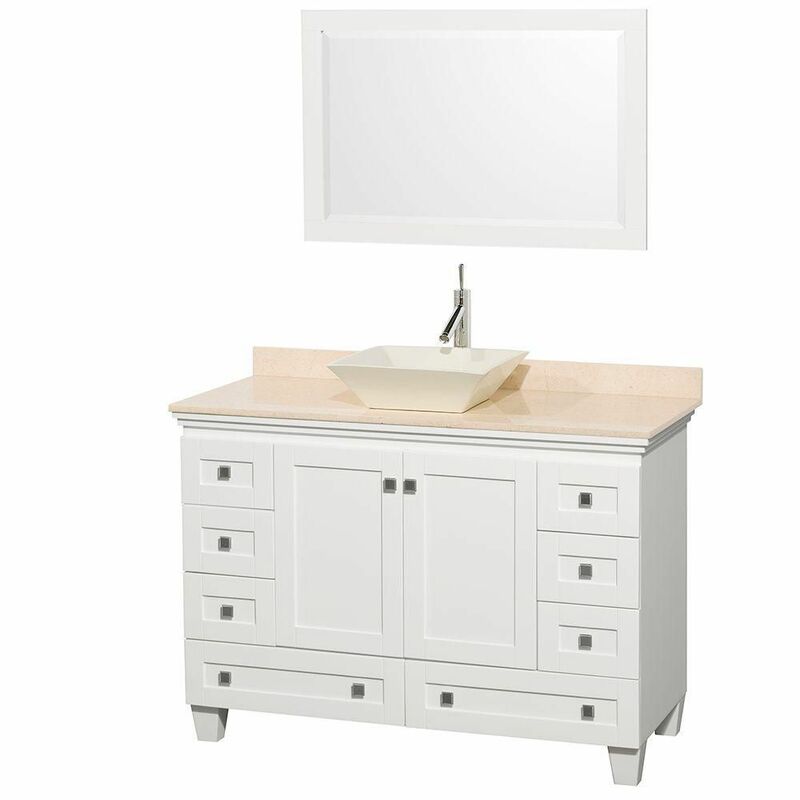 Acclaim 48-inch W 8-Drawer 2-Door Vanity in White With Marble Top in Beige Tan With Mirror is rated 4.7 out of 5 by 12. Rated 5 out of 5 by anna from I recently purchased this vanity and had it installed. It is very well built and of great quality... I recently purchased this vanity and had it installed. It is very well built and of great quality. The only thing I don't like about it is the stems on the drawer pulls are too short, therefore they are hard to get your fingers behind to open. My husband has a harder time of it than I do. Other than that, I am very pleased with it. I guess we will be changing the knobs. Rated 4 out of 5 by latc74 from I received this vanity with some small gouges in the center door and am still waiting for the man... I received this vanity with some small gouges in the center door and am still waiting for the manufacturer to send the paint pen. It is very heavy and solid and we have adjusted the doors to align correctly. I changed the hardware because the square knobs were shallow and looked cheap to me. I am happy I bought it on sale because full price is rather steep for this product. Rated 4 out of 5 by Becky from The vanity is great, lots of storage, well built, and very modern looking. The only problem I ha... The vanity is great, lots of storage, well built, and very modern looking. The only problem I have with it is that the mirror has a dark spot in the middle of it. Rated 3 out of 5 by Ed from For a production type vanity this one is good, though I don't believe that it is really worth the... For a production type vanity this one is good, though I don't believe that it is really worth the purchase price. It was packaged extremely well and arrived with no damage.